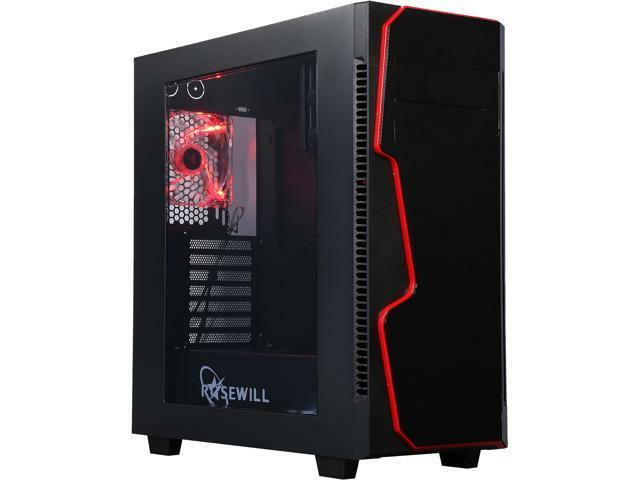 Rosewill knows that gamers need a cool arsenal to back them up in the harsh battle. In order to achieve the goal, a special designed chamber contains PSU and HDD, and separates the airflow into two streams: one from the bottom, cooling the PSU, the other flow drew in by two front fans, lowering the temperature raised by the VGA card and CPU. Coming with 3 preinstalled fans in the front and rear, the Rosewill GUNGNIR X supports up to 6 fans. To further enhance the cooling ability, you can install a CPU cooler with height up to 180 mm. Liquid-cooling is also a viable option since GUNGNIR X supports 280 mm radiator in the front and 360 mm on the top. With a window on the side panel, you want to hide the mess of tangled cables. The Rosewill GUNGNIR X offers dedicated space: the PSU chamber for that sole purpose. Moreover, the installation of HDD/SSD is hiding in the back of the case, making your system even more immaculate when you look into the window. In order to make building the Rosewill GUNGNIR X a simple and enjoyable experience, 5.25” devices installation is absolutely tool-free. All the I/O ports are mounted on top, making it nice and easy for your daily operations. Daily maintenance is simple. Front, top and bottom dust filters keep the critical components from dust and filth. Oh… did I mention that they are easy to remove? 19.57" x 8.27" x 18.90"
NOTICE: Please make sure your motherboard is equipped with on-board USB 3.0 sockets before purchasing. - suprised by all the attention to detail for a low price case. Great Value. Cons: - the front panel is gloss black, which can get fingerprints on it, but for the price, this is the only downside that I could readily see. Other Thoughts: - I would recommend this product if you want a cheap case that works and has good airflow. -The case is very large which allows for easy building and lots of open space to (hopefully) allow good airflow. I'm may place a figurine/action figure to just stand on my PSU shroud since there's so much open space! -The case comes with three pre-installed fans (two in the front and a LED in the back). The case has a fan speed controller which is also a nice bonus. You can choose to connect fans to the motherboard or the controller. -The case has three air filters (top, front, and bottom). The top filter is magnetic and the bottom slides out. The front is a little hard to access. -The design of the case is to have most the wire behind the motherboard which can be a little tricky. I spent a little extra time trying out different arrangement of wires, but am very happy with how it turned out. It's very clean looking with just a few wires viable (main power, GPU power). The space behind the motherboard can also be tight, but I found everything worked fine for me. So take your time and enjoy the end product. -The rear expansion slot covers are metal and not punch out. They are held in place by screws and can be re-positioned as needed. -The front panel has 4 USB slots (2 USB 3.0), audio, mic, the fan control switch, power, and reset. -The internal bays are hidden from view behind the motherboard and PSU shroud. Again, it leads to a very open and clean look. Cons: -The front panel takes a little effort to take off. Once it is off, the wires are still connected. This makes removing the front filter a bit difficult. Also installing the 3.5 optical drive took a little more time. Other Thoughts: I'd definitely recommend this product. It has lots of value for it's price point. I also like the style of the case. -The side panel is plastic (which is stated). It'd be nicer if it was glass. -The fan controller is a slider that goes low - off - high. I would have preferred if it went off - low - high. I imagine the second that it goes from low to off to high wouldn't actually matter, but it just seems a bit odd that off is in the middle. I keep my fan on low and imagine I'd switch it to high when it's needed so going off first is weird. Pros: I bought it for 35 on a sale. Great value at that price. Seems about right for what I needed. 3x ssd installation brackets on the back panel and 2x 3.5 hdd also on the back. cool design for cable routing and management. Fan filters and easy removal of top fan filter for cleaning (it's magnetic and sticks to top). Fan controller is a cool feature. Cons: only 1 red led fan included. the other 2 fans don't light up. not much room to route cables behind case like the thick psu cables so those will be seen. smaller cables can maybe go behind. Other Thoughts: I really like this for 35 and a simple clean design. around 75 there is a ton of competition. Pros: Plenty of room to work with. Airflow is excellent. Cable management does not get much better (see con). Very satisfied with the ease of my build. Cons: If the "back side" panel beveled to give maybe another 1/2 inch of space under the cover, this would be perfect. As in you are a fool not to build in this case perfect. Not really a complaint, a suggestion. Pros: Very roomy, looks great from the outside. Cons: Glass does get dirty easily with fingerprints, etc but that's expected. Other Thoughts: Everything on the case has a Red LED except the power light which is blue. -Satisfied with the overall look and presentation. pretty annoying to find out it doesn't work at all after fully building. The hub itself works fine because my fans are all running, but no change in fan speeds whatsoever, controller a big bust. Thank you for your purchase and feedback. I have forwarded your valuable feedback of the GUNGNIR X Cable management to our product management for review and please rest assured that your feedback will receive the attention it deserves. We will continue improving our products in future. Thank you. Pros: So after building in it I can say it went pretty well and I still hold all my previous pros. Cons: On the other hand there were 3 glaring issues with this case. I broke a USB 3 header on my mobo since there is a piece of metal in the way and the plastic cable shroud is too small and I had to take it off. Other Thoughts: If you are buying this for a purely budget build than it's a great value but if you have a budget of around 1000$ plus than you should maybe invest 10% into the case.